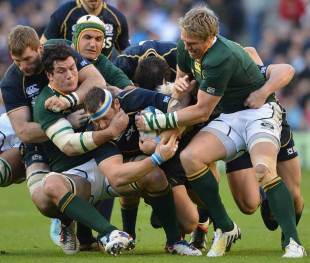 Springboks coach Heyneke Meyer singled out his side's defence following their hard fought 21-10 defeat of Scotland. The Boks were in charge in the first-half, with Adriaan Strauss' try along with three penalties from Patrick Lambie putting them ahead, but came up a reinvigorated Scotland outfit in the second 40. Andy Robinson's side hammered away at South Africa's line for much of the last twenty minutes but the Boks' defence held firm - much to the delight of coach Meyer. "All credit to Scotland, they played superbly and just great, great defence kept them out," Meyer said. "It was not a great game but I'll take an ugly win. We know we can play much better but we mustn't take anything away from Scotland. "They came out and gave everything for their country. I think they can be proud of what they achieved today. We're in a learning curve and I thought the guys didn't panic. Our defence was awesome. "To keep them out at the end, it really showed the character of this young team." One of their star performers was flanker Francois Louw, who was given the Man of the Match award, and he too praised his team's defence. "You've got to give credit to the Scots," Louw told the BBC. "They came out and put on a fight there. We had to fight for every inch. Credit to our guys for holding out in defence."